A supremely versatile touch screen epos panel within a sleek compact design which improves speed and efficiency in all hospitality environment. 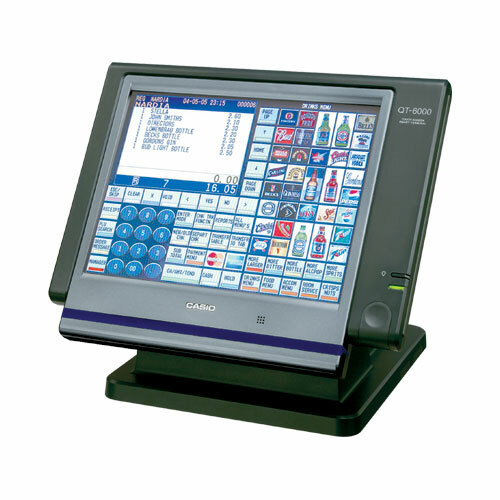 Casio QT-6000 large colour LCD screen with a touch screen feature makes it easy to use for most types of stores especially in the hospitality market. Bitmap images can be linked to the keys to identify functionality by image and assist the operator. The touch screen supports colour themes that can be selected to fit the atmosphere of the store. The Casio QT-6000 is equipped with standard features and functions such as shared table tracking and printer sharing typically used in restaurants, cafes and bars. Communications between terminals are made using Ethernet, which can be configured easily and accurately with the automatic ID setting function. An optional high-speed radio frequency wireless communication function is available to offer solutions in cases where it is difficult to install wired Ethernet communications. Transaction items displayed on the optional external remote display using a wide 3-colour backlit LCD which can easily be read by the cusotmer.